March 28, 2016 – A new NASA airborne field experiment planned for this summer will make key airborne measurements of clouds and smoke particles over the southeastern Atlantic Ocean to help scientists understand a major challenge to our understanding of climate science. 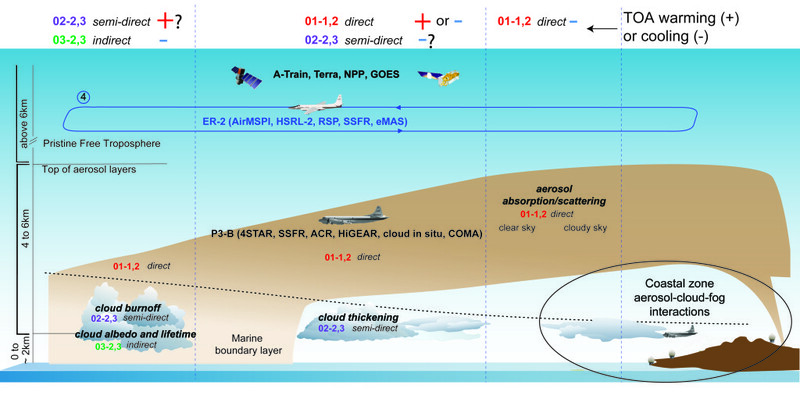 One of the primary goals of NASA’s ObseRvations of CLouds above Aerosols and their intEractionS (ORACLES) campaign is to understand the extent to which clouds and the smoke interact and the degree to which smoke particles serve as nuclei for cloud droplets. To address these issues, a research aircraft will make measurements of smoke and cloud layers. 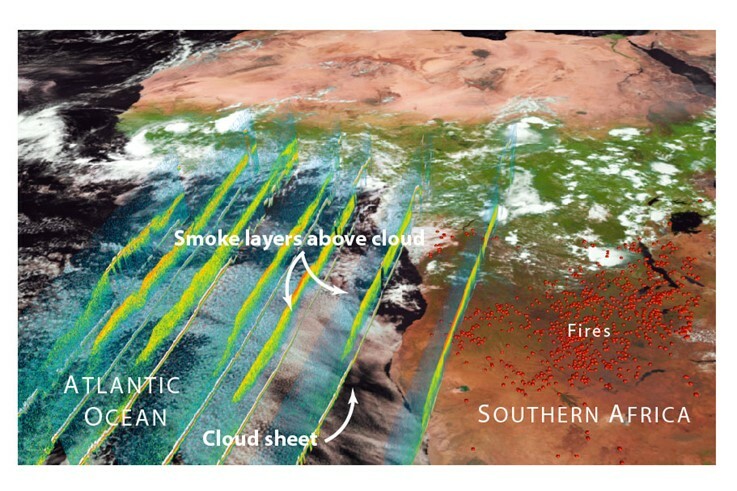 In combination with extensive satellite mapping of smoke and clouds, ORACLES aircraft flights will allow scientists to gather the information needed to understand whether smoke from African fires is changing the way in which marine stratus clouds off the west coast of Africa cool the Earth. This remote area is home to one of the largest layers of low clouds on Earth. These clouds reflect a large fraction of the incoming sunlight back to space and act as natural “reflectors” that help keep the planet cool. In these clouds, water droplets, each roughly 1/10th of the thickness of a human hair, form by condensation of water vapor onto even smaller particles called cloud condensation nuclei (CCNs). Both natural and human sources of these nuclei can be important globally affecting the properties of clouds. Recent studies have shown how a lack of CCNs can make it difficult to form the bright clouds that reflect sunlight. Owing to the large distance from major aerosol sources, the remote southern Atlantic can be relatively starved of natural CCN sources. NASA satellites, most notably the spaceborne CALIPSO lidar and other instruments in the A-Train constellation, have been observing a possible major additional source of cloud nuclei for a decade. This source of nuclei might extend the lifetime of Atlantic cloud decks. Extensive regional burning of biomass – organic matter derived from recently living vegetation – due to both natural processes and human activities occurs in southern Africa during the dry season from July to October. This burning is responsible for approximately 30 percent of global biomass burning emissions, and produces extensive layers of smoke containing large numbers of cloud condensation nuclei transported by prevailing winds over the southern Atlantic west of Africa. Smoke particles may also cause clouds to be brighter (i.e., more reflective). However, according to CALIPSO satellite lidar data (see figure), the smoke layers mainly reside above the clouds and may not actually get into the clouds to serve as CCNs. CALIPSO lidar data provide a tantalizing indication that smoke can reach down into the cloud decks at times. In addition, the smoke can obscure the clouds below, making it difficult to tell whether the clouds contain more droplets as the smoke descends into the cloud deck. Data collected during the ORACLES campaign will begin to answer fundamental questions regarding the cooling effect of clouds on our planet and how that process may be affected by pollution and smoke from African fires in the southeast Atlantic Ocean region. CALIPSO is part of a constellation of spacecraft called the “A-Train,” including Aqua, Aura and PARASOL, dedicated to studying the Earth’s weather and environment. CALIPSO launched with Ball Aerospace-built CloudSat on April 28, 2006 from Vandenberg Air Force Base. Ball Aerospace built the LIDAR (Light Detection and Ranging) and wide-field camera instruments, the communications equipment, and integrated the payload for the CALIPSO program.